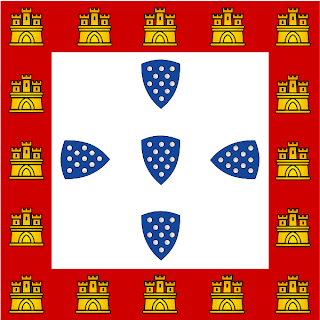 The first heraldic emblem that can be linked to Portugal was the colours on the shield used by Count Henry of Burgundy. This was in 1095, and was a blue cross over a white field. 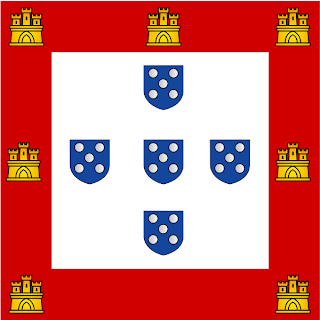 Henry's son, Afonso Henriques took the throne, and took the same shield. In 1139, he was involved in a bloody battle, where his forces where outnumbered by a Moorish army. However, he prevailed in the battle. In the battle's aftermath, he declared himself King, and in 1141, he was given official recognition of his deeds. In honour of this, he placed 5 sets of 11 bezants over the blue cross. Most likely they where silver nails driven into the shield. When Sancho I came to the throne in 1185, he inherited his fathers shield. As was tradition, shields went unrepaired, and the shield he now inherited no long featured its blue cross, but only scraps of leather pinned on the shield by the bezants. With a little re-working, these where turned into shields, or escutcheons. Thus, the Portuguese Quinas where born. 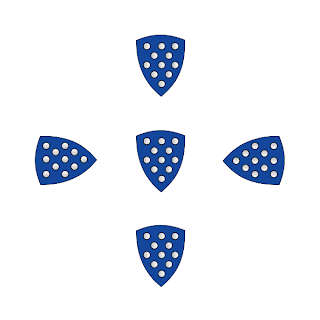 Afonso III was not the oldest son when he came to the throne, and he had to follow heraldic practise which stated that he should not directly inherit his fathers heraldry. He had to modify it. Afonso had married Beatrice of Castille, and it is through this family tie, and his mother also being Castillian, led him to add a red border charged with an indeterminate number of gold castles. With the accession of King John II in 1485, the final changes occurred to give us many parts of iconography that are now in use today. King John II reduced the number of bezants from 11 to 5, and reorientated the Quinas so they all pointed down. Also, he cut the number of shields to just 7. King John II was the last King to use a square banner, with following monarchs choosing to use a banner charged with the coat of arms, and in 1640, with the accession of King John IV to the throne, the shield element of the coat of arms was changed from an ogival shape, to the rounded shape we see today. In 1816, King John VI came to the throne of Portugal, whilst in Brazil. The Portuguese Royal Family had fled there when Napoleons armies had marched in. In honour if the union between Brazil and Portugal through the crown, his standard reflected that. He took the rounded shield of Portugal, and mounted it on a blue-filled yellow armillary sphere from the arms of Brazil. When John VI died, his son, Peter, inherited the thrones of both Portugal and Brazil. However, the new Brazilian constitution forbade him from taking both, so he abdicated from the Portuguese throne in favour of his daughter Maria da Gloria, who became Queen. However, at the age of 11, she was too young. So, she was married to his brother Miguel, who would stand as regent until she came of age. However, in 1828, he deposed Maria, scrapped the constitution, and proclaimed himself King. Maria and her Liberal supporters fled to the islands of the Azores, where they launched their fightback. Whilst in exile, the government of Maria created a new banner. This time, taking Maria's coat of arms, and placing them in the centre, with the flag being split equally between blue on the hoist side, and white on the fly. This flag was only to be used on land. The naval ensign saw the coat of arms shifted closer to the hoist, shrinking the amount fo blue to one third the width of the flag. A design similar to the flag today. 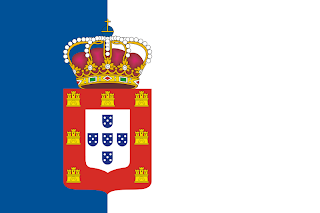 These flags where then used by the Portuguese monarchy, until their overthrow in 1910. In 1891, there was a failed Republican uprising, and after this, the colours of red and green became more and more associated with the Portuguese Republican Party. Then, in 1911, with the Republicans having successfully overthrown the Monarchy, these colours where adopted as the new national colours for the flag. Following this, the colours where promoted as representing hope through the green, and the blood of fallen heroes, through the red. This belief was pushed to try to de-politicise the colours. A minor coat of arms was design for the flag, taking the shield from King Peter II, and bringing in the armillary sphere from King John VI. 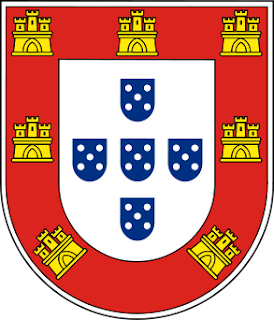 The arms where used to represent Portugal's history, and the armillary sphere was used to represent Portugal's maritime history. The colours on the flag where arranged similar to the naval ensign of Maria I, with the first 2/5ths from the hoist being green, and the rest being red. On the join between the two colours, the new minor coat of arms.